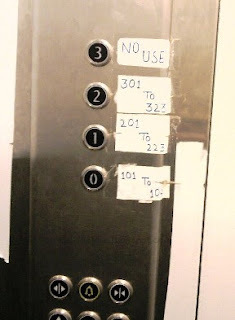 Would you travel in this elevator? Left out in the lurch – why? Many people would wonder – how come the Left parties fared so miserably after a spectacular showing in 2004. After all they surprised everyone (including themselves, I suspect) in 2004. Who would have imagined the communists to be a part of the ruling alliance in our country? Many theories would be floated now – the most popular ones being about ditching the Congress on the matter of nuclear deal or about the Singur fracas. I have a different answer – provided to me in a rather comic manner by none other than Brinda Karat. No – I didn't speak to her – I was watching her interview on NDTV. After she was done with her predictable statements (this will require introspection, we accept the people's verdict, etc etc etc) she was asked a question by Mukul Kesavan. And this is EXACTLY what she said. "That was a very interesting question, but I am sorry I couldn't quite follow you. Could you please repeat that question?" Now – it is quite possible that the phone line was bad and she couldn't hear the question clearly. Fair enough. Then where was the need to say 'that was a very interesting question' ? Some time later Prakash Karat vindicated this by his statement which was in response to the que about their role in the new Lok Sabha. He said – we will argue in favour of alternate policies. We have always done that. Ever since the first general elections in 1952, we have always argued for alternate policies. Even when we were part of the ruling alliance, we still argued in favour of alternate policies. That is a politically correct way of saying – when everyone is looking one way, we will always look the other way. Immaterial of which one is the appropriate way. Many years ago, I was reading an article in India Today on the annual politburo meeting of the CPI(M) – mind you, these were still days of Harkishan Singh Surjeet and Jyoti Basu. The article began something like this. They got a chance to jointly lead after 2004 and now they have botched it big time. The communists have to choose, and choose fast between being a part of the mainstream of the country's growth or be counted among those dead. So the wait is over and we finally know who is going to occupy the treasury benches in the Lok Sabha. As we hear the politicians say their all-too-familiar statements, there are some points that are clear already. The Indian electorate has proven beyond doubt that they can't be hoodwinked by silly political rhetoric. You can fool some people some times, but you cant fool all of them all the time. They have voted for a govt. that held office for 5 years, in spite of its various mistakes. What's more, they have given the Congress an even better mandate than last time around, so that the Cong need not worry about keeping a clutch of petty-minded allies happy, just for the sake of ensuring the magic number of 273 intact. For much the same reason, all the clowns have suffered a bad defeat. Vaiko, Ramadoss and their shouting buddies are nowhere to be seen. Laloo and Paswan's seats put together don't even come to double digits. Mayawati's dreams of riding the elephant to the Prime Minister's office will have to wait. Yesterday, I wrote about Amar Singh's statement about being political virgins. After it was clear that Congress was winning and might not need SP's support to form the government - he was brazen enough to state that SP has always stood by the Congress in difficult times. Pathetic politics. Political virgins or political beggars? As for the other factor that occupies a large part of our lives these days – the media. I followed the prominent news channels for the day and here are some of my observations. CNN-IBN – Only Rajdeep Sardesai can compete with Arnab when it comes to shouting. (In the shouting male anchors' category, that is. The undisputed queen of shouting is of course Barkha Dutt). When he had finished shouting his lines on CNN-IBN, he went over to the sister Hindi channel IBN 7, to shout in Hindi. All throughout, rather than report the results, he was more keen to remind the viewers that the CNN-IBN exit poll was the closest to the actual results. This was a blatant lie - because no exit poll had predicted so many seats to the UPA. NDTV 24 x 7 – By far the most tolerable, barring Barkha Dutt. She did provide the viewers with moments of entertainment in between. Once for a few seconds, she was wildly gesticulating and contorting every muscle of her face to the camera team, without knowing that she was ON camera! Throughout the day we could hear her whispering something while others spoke. No matter what any Congress leader said (and this was much after Sonia Gandhi had declared that Manmohan Singh would be the PM) she was intent on raking up the same question - will Rahul Gandhi become the PM? One thing common to all channels. Their computer graphic designers went completely overboard. The graphics were too much for the eyes. What the viewer wants to see is clear numbers, not maps and images flying in and out of the screen. Vikram's fascination with the large touch screen map (he said so much on the camera) was silly and a waste of time. Shekhar Gupta (NDTV) – Indian voter has moved from the politics of grievance to the politics of hope and aspiration. Well said, Shekhar. We can all get back to work now. "it is all open now. Congress will ask us only if we have the numbers (that's a rare bit of candour on part of Amar Singh, I must admit). We are political virgins." Whoa - what was that? Political virgins?! I know what he is saying (I hope so!) but he has got his metaphors all mixed up. I decided to look up the dictionary meaning of 'virgin' and I quote from the online dictionary. 4. the Virgin, Mary, the mother of Christ. 5. Informal. any person who is uninitiated, uninformed, or the like: He's still a virgin as far as hard work is concerned. 6. a female animal that has never copulated. 8. (initial capital letter) Astronomy, Astrology. the constellation or sign of Virgo. 9. being a virgin: a virgin martyr. 10. of, pertaining to, or characteristic of a virgin: virgin modesty. 11. pure; unsullied; undefiled: virgin snow. 12. first: the senator's virgin speech. 13. without admixture, alloy, or modification: virgin gold. 14. not previously exploited, cultivated, tapped, or used: virgin timberlands; virgin wool. 15. without experience of; not previously exposed to: a mind virgin to such sorrows. 16. Informal. being a mixed drink resembling a specific cocktail but made without any alcoholic ingredient: a virgin piña colada. 18. (of a metal) made directly from ore by smelting, rather than from scrap. 19. noting the oil obtained, as from olives, by the first pressing without the application of heat. No matter which way we look, none of these meanings fit Amar Singh. Even if we consider the meaning which Amar Singh wants to convey - it is hard to believe him. Amar Singh can write the Political version of Kamasutra if he wants to. Vatsayana described only 64 ways in his Kamasutra - Amar Singh can describe 64,000 ways to do it in Indian Politics. The Wikipedia page for Amar Singh begins like this - 'Amar Singh (27 January 1956 born in Aligarh) is widely regarded as one of India's most corrupt politicians.' I just hope that Amar Singh is soon relegated to being a political recluse rather than the virgin that he claims to be. I am back here after a hectic all India tour. Two days each in Chennai, Mumbai, Nagpur, Kolkata, Delhi and Patna. The average temperature at these places was in the mid 40s, and as a result, I slept fatigued for the whole day today, waking up only at 5 in the evening. 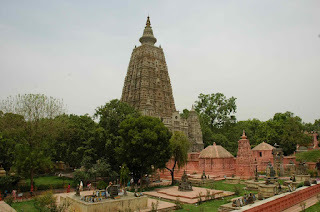 I got a chance to visit Bodh Gaya during this trip. I am very wary of visiting temples. It has nothing to do with me being a believer or an atheist. In the past few years, my thoughts on this matter have become really ambivalent. The file named 'God' in my life has got labeled as 'pending for perusal!' But when it comes to temples - I get put off by the commercialization, the jostling crowds, and above all - the total lack of cleanliness. 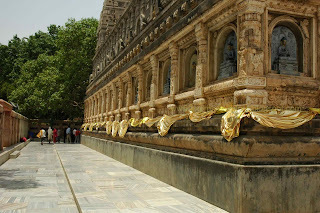 Bodh Gaya was a pleasant surprise. The fact that temperature was touching 40 and that summer is anyway the off season for tourists may have contributed to the sparse crowds. At the entrance of the temple, we were surrounded by guides and my heart sank. We nevertheless decided that we would hire a guide (I actually said to Parvez that if not for anything else, we can at least have a good laugh about the guide's tall claims afterward) and it proved to be a good decision. Mr. Ramkishan was a really good guide. Firstly, he never made preposterous claims. E.g. he mentioned honestly that most parts of the temple were built in the 19th century after a Englishman Mr. Cunningham discovered the buried ruins of the temple. God bless Mr. Cunningham's soul. OK, I hope God ignores what I have said about Him earlier in this post and blesses Cunningham anyway. Secondly, he was really good at explaining Buddha's thoughts, his teachings, the reasons behind the split of Buddhist religion into Heenayana and Mahayana, and so on. He was candid in a very nice way about some of his narrative. He told us that Buddha sat in penance with 5 other Brahmins in search of knowledge, and they all had pledged that they would not take food or water till they got what they sought. (Clearly, today's politicians have suitably altered the rules of a fast for their convenience!) Then came along this lady Sujata who saw Buddha's famished condition and offered him kheer (made of rice, specified Mr. Ramkishan). According to our erudite guide, Buddha heard a voice which reminded him that in case he died in this cause, that would be a rather awful waste, wouldn't it? OK, that's not the way Ramkishan told us, but I hope you get the drift. So Buddha decided to accept the Kheer, which predictably annoyed the remaining five famished ones a lot. What Ramkishan said after that was really interesting - "either the Kheer was really nourishing, or because Buddha was not a normal person like you and me, but the reality is he quickly recovered from his skin and bones conditions and gained enough strength to walk to this place in double quick time." That's as candid as you can get. The temple premises are clean. Absolutely clean. I don't know if only Hindus specialize in creating a mess at their religious places or whether the Bodhgaya temple is maintained by virtue of being a World Heritage site. Whatever the reason, it was a pleasure going around. Yes, outside the temple there are the usual troublemakers. One guy chased us for about 100 mt. trying to sell CDs of Buddhist chants. When we told him we were not interested, he tried with a video CD and also reminded us 'saheb, is mein Buddha ke janam se end tak sara scene dikhaya hai'. No, thanks. Mr. Ramkishan has already taken us through those details, and very well too.